Psychology flash cards can be a very useful study tool. They can be particularly helpful when you are trying to memorize important facts, dates, and concepts. 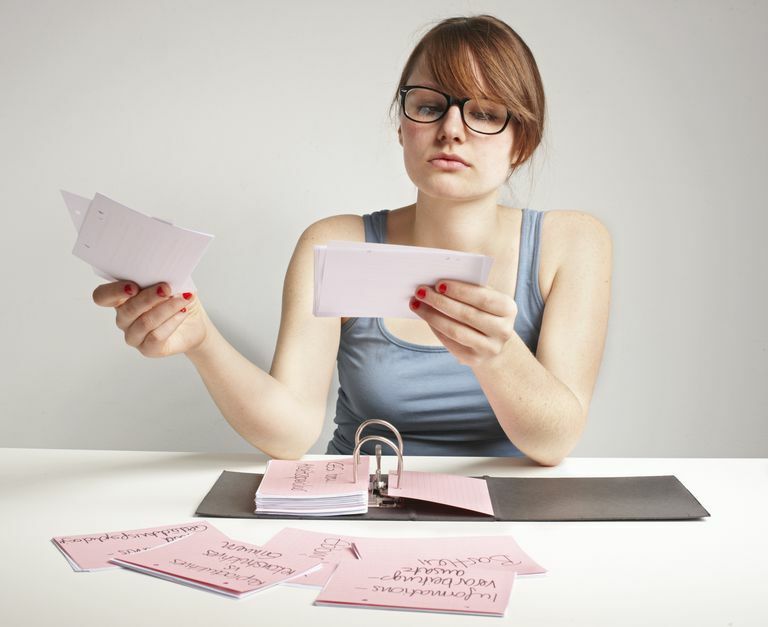 Check out some tips for how to prepare your own flash card, other places you might find useful psychology flash cards and a few ideas for how to best use these tools in your study sessions. The best way to use flash cards is to make your own set of study tools. This way you can incorporate the information from your class notes and required readings. Remember this handy rule of thumb – if your instructor talked about it in class, then it will mostly likely be on the exam. Start by getting some blank index cards in whatever size works best for you. Index cards can be found in most general stores, office supply stores or even at your university's bookstore. Don't be afraid to stock up on cards – you can always use the extras to make flash cards for later exams or even other classes. On one side of the card, write down one fact that you need to memorize. Potential facts might include the names of famous psychologists, key terms, theories and important dates in history. Only list one fact on each card. A learning method that utilizes reinforcement and punishment to either strengthen or weaken responses. You can also pose your facts in the form of a question, i.e. "What is the learning method that utilizes reinforcement and punishment to either strengthen or weaken responses?" Go through your psychology notes and readings and pick out the information that you need to study. Make as many flashcards as you need to adequately cover the material. How do you select the information to include in your flash cards? Start by looking at the bolded key terms in your textbook. Also check the summary section at the end of each chapter for a review of some of the key terms and concepts that you should probably include in your flash cards. If you are studying for a standardized test such as the AP Psychology Exam, then you might be interested in purchasing flash cards that are specifically designed for that test. For example, Barron's AP Psychology Flash Cards is a study tool that includes 500 flash cards focused on terms that might appear on the AP Psychology test. Another great place to look for flash cards is in your own textbook supplementary materials. Many textbooks also have online sites where students can access additional study tools, including interactive flash cards. Finally, you might consider forming a study group and working together to create your own set of flash cards. For example, let's imagine that you and nine of your classmates decide to form study group. Each member of the group is assigned a chapter and asked to create a certain number of flash cards on key material. Once everyone has created their assigned flash cards, you can make copies and distribute them to members of the group so that everyone has access to all of the flash cards. Now that you've assembled a collection of flash cards, it's time to start studying. Start by mixing up the cards so that they are in a random order. Next, start working your way through the cards and see how well you do. How many answers do you know? If you end up with a very large stack of cards, you might want to break them up into smaller chunks, perhaps sorting them by topic or by book chapter. Verywell.com's Expert to Homework Tips, Grace Fleming, has lots of great ideas for how you can use flash cards study. Be sure to check out her ideas for both individual and group studying. What Is a Learning Style Inventory and How Is it Used?